23 AUG 2016 news: ALL replies to received QSLs have been mailed today. I herewith offer to manage your direct 6m and HF QSL cards to EX8M and EX9T EX8MAT if they arrive with SASE +1 IRC or 2 USD to my address in Switzerland before 5th of August 2016 as I am going to visit the EX country and most probably EX8M (not sure EX9T as out of my route) but I can let have them delivered. 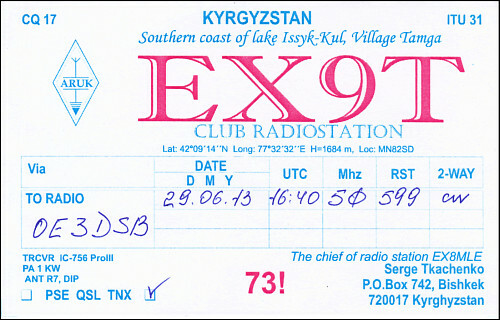 13 July I sent you a letter (with 1 IRC) with the QSLs for EX-stations. I hope that will reach on time. I will write you to confirm receipt of your envelope as soon as arrives. All QSL were sent yesterday from HB9 by priority mail. I hope you will receive yours soon. Thank you very much for your help in getting the cards and new one on 6m! It has been my pleasure giving this service to our community. I will do it again in the future if the situations will permit it as well.